WIlliamsburg, VA-The Revolutionary City in Colonial Williamsburg's Historic Area combines the art of entertainment and the life lessons of history in a unique theater of edutainment. In order to deliver the colonial period performances to a large audience, the use of today's audio technology is necessary, but must also be inconspicuous so as not to distract the audience from the overall colonial experience. Thirty-three AKG Acoustics WMS 4000 wireless systems helped Colonial Williamsburg achieve its goal of historical accuracy, while delivering solid reliability and high-quality speech reinforcement for full audience appreciation. Each location within the Revolutionary City in Colonial Williamsburg's Historic Area presented unique opportunities. The Capitol Building and Raleigh Tavern locations both feature AKG RA 4000B omni-directional wideband booster antennas in the surrounding trees delivering solid coverage and performance. Operated by The Colonial Williamsburg Foundation (CWF), the Colonial Williamsburg living history museum encompasses over 300 acres in Williamsburg, VA. The property includes numerous historical buildings, 88 restored original structures and hundreds more reconstructed, but all preserved to recreate Virginia's 18th-century capital city. The Revolutionary City is one of the many areas within Colonial Williamsburg and features an outdoor two-hour live theater performance seven days a week. Three venues in The Revolutionary City are equipped for reenactments of various historical events. 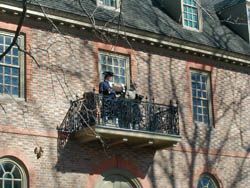 The Capitol Building and surrounding courtyard, the Raleigh Tavern and Charlton's Coffeehouse pasture each play host to the museum's daily performances. Onyx Engineering, with offices in Richmond and Chesapeake, VA, designed and installed the audio system based on site-surveys of the grounds; meetings with Tom Peck, CWF director of planning and Bill Wagner, director of Colonial Williamsburg Productions; and the recommendations of CWF consultant R.L. Philbrick, Jr. of Acentech. "The audio system needs to provide the highest quality speech reinforcement for live reenactments as part of the Revolutionary City adventure," said Nelson Hoyt, Onyx Engineering director of sales. "Because the performances are continuous and move among the three venues, there are many logistical challenges, such as changing the actors beltpack transmitters on-the-fly while they transition to a new venue." The design created by Hoyt and Onyx Engineering owner and senior designer, Tom Beaudry, not only answered CWF's current needs but also took into account future growth of the venue. "The CWF wanted a system that would leave room for the possibility of simultaneous performances at each venue," commented Hoyt. "As a result, we have the various wireless microphone systems operating in different frequency bands and on different frequencies at each venue." The Capitol Building and Raleigh Tavern locations both feature AKG RA 4000B omni-directional wideband booster antennas in the surrounding trees delivering solid coverage and performance. This was especially important for the Capitol Building, where two courtyard performances currently take place, but on opposite sides of the building. The coverage provided by the AKG RA 4000B takes care of the existing needs as well as the planned addition of a third performance area. During the course of the two-hour performance, every wireless system is kept on at all times because each venue is used at different times during the performance. As a result, system muting at those venues not in use is paramount. One of the challenges for Onyx Engineering was to set up the proper squelch threshold for each system at each venue so that the wireless receivers would automatically mute once an actor walked out of the effective range of the venue. And all of this is accomplished without a system operator. Under the management of Jim Survil, chief engineer at Colonial Williamsburg Productions, the systems are set up to run automatically. The wireless systems are tested every day by a production assistant then simply turned on. Each actor is outfitted with an AKG CK77 lavalier microphone which they wear continuously in all venues. As they transition between venues, their beltpack transmitters are changed to match the receivers at the new venue. There is no real-time mixing required during the performances. "One of the primary reasons we chose the AKG system is the unique charging system that allows a user to simply drop a complete bodypack transmitter into a charger and forget about it," said Hoyt. Onyx Engineering has created a chart that provides a quick guide to the various LED indicators on the 'smart' chargers so management of the systems batteries is not a time-consuming task for Colonial Williamsburg Productions.